When I was a teenager, my father would often impart on me some wisdom, “communication is one of the most important tools to success”. I would typically look at him dumbfounded. I didn’t take any communication classes, so how could it be so important? Only until I began stumbling through the beginning of my career, saying the wrong things, not listening, and typically acting like a bull in a China shop did I start to understand my father’s wisdom. Strategic leaders spend most of their time communicating, which is essential to discovering new facts and perspectives, creating new ideas and opportunities, aligning people, building relationships, planning the right course of action, and making sound decisions. More than ever, with the onslaught of communication mediums and the sheer volume, communication skills are at a premium. Every day a strategic leader faces potentially hundreds of emails, dozens of informal and formal meetings and conversations. At McKinsey, in a survey we conducted on communication complexity, people estimated their organization’s productivity could be improved by 25% if there was effective communication in their organizations. Improving communication skills across a few dimensions is critical, including choosing the right communication medium, and improving written, verbal communication, and presentation skills. Let’s go over the details and best practices. Utilzing the right communication medium for the situation can dramatically improve communication. Over the past few decades, companies evolved an overdependence on email as the primary form of communication. Just think about the low percentage of emails that are important or actionable. So, what is the right communication medium for the job? First, it is important to understand all of the communication mediums. It is useful to separate them by one-on-one, small groups, and corporate communication, and then in-person, and virtual synchronous and asynchronous communication. Syncronous means “real-time”, while asynchronous is intermittent, with time gaps between communications. Below are all of the different communication mediums within an organization. It is a bit crazy how many options there are. Unfortunately, too often the wrong medium is used for the situation. 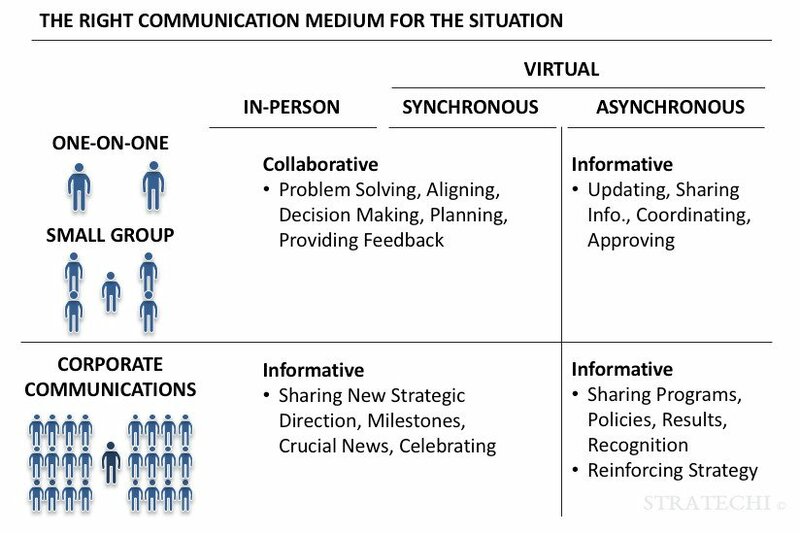 For one-on-one and small group communication, in-person and virtual synchronous mediums should be used for collaborating, such as problem solving, aligning, design making, planning and providing feedback. While asynchronous mediums should be used more for informing, such as updating, sharing information, coordinating and approving. Too often asynchronous mediums are used for collaborating which typically impedes the rich dialogue that is often needed for strong collaboration. Most all of the corporate communication mediums are for informing. The demarcation of which medium to use in corporate communication comes down to the importance of the message. When sharing new strategic direction, milestones, crucial news and celebrating, it is more appropriate to use in-person and virtual synchronous mediums. While less important information such as sharing programs, policies, results, recognition and reinforcing strategic messages should utilize virtual asynchronous mediums. That being said, there have emerged a few virtual asynchronous mediums such as online prediction markets, polls, and surveys that can facilitate a semi-collaborative organizational dialogue. 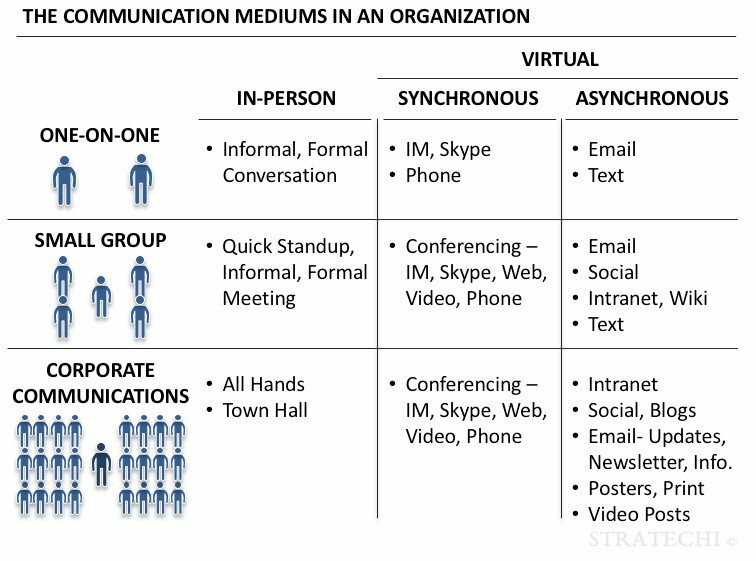 Typically the success of strategic leaders is predicated on spending more time using in-person and virtual synchronous communication mediums than virtual asynchronous mediums such as email. The best communication advice often simply comes down to “have a conversation, rather than send an email”. Be clear and concise with written communication. A useful tool for being clear and concise is The Minto Pyramid Principle. The Minto Pyramid Principle is the go-to written communication tool for strategic leaders and top strategy consulting firms. The pyramid principle is simply organizing and communicating your thoughts like a pyramid. With the top layer being your main thesis or recommendations, the second layer being the supporting facts, arguments or points. And, sometimes, typically in long presentations and reports there may be a third layer. Most people communicate in storytelling or linear fashion. They start their written communication from some point in the past and write a sequential story with the punch line at the end. Unfortunately, in business, sequential storytelling can quickly lose an audience’s interest. The Minto Pyramid Principle puts the punchline first, and then you reinforce your punch line with structured thinking. 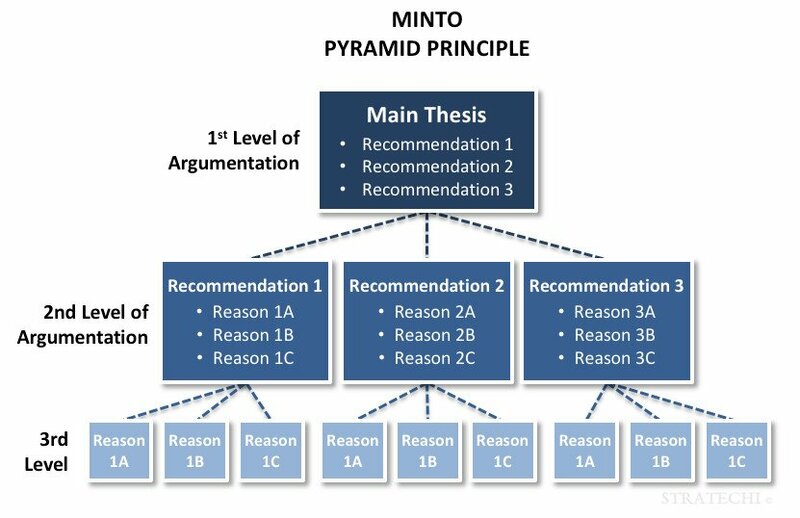 Typically for people to get their heads around the Minto Pyramid Principle, they flip their communication style upside down, starting first with the conclusion and then backing the conclusion up with facts and arguments. You can use simple mental queues such as, “Let me start with the main takeaway…” or “The top 3 insights from this analysis are…” If you want to learn more, read Barbara Minto’s book The Minto Pyramid Principle. Verbal communication is a two-way street, necessitating a balance of listening and talking. As I’ve written throughout this site, understand other people’s perspective by asking the right questions, and empathetically listening. When it comes to talking, there are some best practices. First, structure your thoughts and arguments. The Minto Pyramid Principle needs to become second nature in both your written and verbal communication. Start out with the main point and then reinforce your main point with structured arguments. You’ll be amazed out how well people respond to clear, concise and structured arguments. Second, be confident in your delivery. 90% of verbal communication is non-verbal. So, have a confident posture, look people in the eye, project your voice, and use your hands to reinforce your words. Third, every once in a while, when you are talking, stop, take a pause, and let others join the discussion. One of the easiest ways to kill a conversation is to keep on talking. People don’t have the patience or ability to focus when someone hogs the airtime. Fourth, get to know your fillers, those sounds and words that you fill the space between your arguments with, such as “umm,” “like,” “I mean,” “you know?” and “ok.” Have someone you trust observe you and tell you your fillers, and then become aware of them, and work on reducing their use. Fillers are typically a blind spot in most people. Early in my career, one of my most dreadful moments was watching myself on video present as part of a presentation skills training. It was painful watching myself struggle through the presentation, yet I became self-aware of what I needed to improve, which was invaluable to my growth. Today, I am in the minority, as I enjoy presenting to small and large groups of people. I love creating energy in a room by offering new ideas, clarity about the path forward, or novel insights. Giving a solid presentation starts with creating a persuasive presentation or speech. The key is to develop your own presentation or speech, so that you are comfortable with the content, arguments, and supporting facts. People who deliver a presentation they didn’t develop often stumble through the delivery. If you have confidence in the content, you’ll be more confident in the delivery. Don’t memorize the content. Memorized presentations or speeches can be hard to watch since the person is typically more focused on making sure they get the sequencing of the words right versus the central messages of the presentation. Focus on the big messages, and use the content as a guide to trigger the next group of arguments. Also, breathe and pause after some of the big arguments. Periodically ask the group if they have any questions. Try to make a presentation more dialogue versus a one-way street. And, watch your physical mannerisms, including fidgeting with your hands or a pencil, pacing back and forth, touching your face, looking down or at the screen most of the time, etc. © Stratechi, 2018. All rights reserved.